That’s a very busy intersection, its very difficult to get a photograph let alone lay down tile in the concrete. I worked at this intersection for a little over a year working many late nights in the office. I can’t imagine how anyone could have done this. If this cryptic tile and cryptic construction looks familiar, you are probably familiar with the Toynbee tiles. In order to begin to get what the hell these House of Hades guys/gals/guy/gal are we must first look at the mysterious Toynbee tiles. This mish-mash of ideas does have some thread of logic, albeit twisted. There are three people to look at: Arnold J. Toynbee, Stanley Kubrick, and Sir Arthur C. Clarke. Arnold J. Toynbee was a British historian who presented history as a universal rhythm of rise and fall with reoccurring themes and allusions. He became a household name in the 1940’s as the world sought to deal with the new superpowers of the United States and the Soviet Union. His ideas provided a kind of cushion, and familiar grounding to an unfamiliar situation. He was a little spiritual (in regards to the dead and such) looking at the role of Eastern and Western thought. American Stanley Kubrick directed 2001: A Space Odyssey, a groundbreaking film that changed the way people thought about science fiction. Arthur C. Clarke wrote 2001: A Space Odyssey the novel. As Kurbrick and Clarke bounced ideas off of each other they thought it only fitting that the movie says “Based on the novel by Arthur C. Clarke” and the novel says “Based on the movie directed by Stanley Krubrick.” Kubrick approached Clarke about the idea of making a sci-fi flick about humans having a ’spiritual’ encounter with extraterrestrials. Kubrick had read Clarke’s fiction such as “The Sentinel“, Childhood’s End, and “Jupiter V” which directly references Toynbee. At the end of the novel/film the main character Dave Bowman is transformed after traveling to Jupiter into a spiritual being beyond his physical body by fantastic alien technology beyond our comprehension. If one was incliend to a certain set of beliefs usually dubbed, oh crazy, they might think that Toynbee and Kubrick were on to something such as the dead can be revived on Jupiter. There are numerous theories on who made these tiles. In more recent years many suspect its the work of copycats as whoever did these must be getting on in years as well as different artistic signatures as far away as Iraq. Though some presumed original and presumed tiles do pop up now and again. 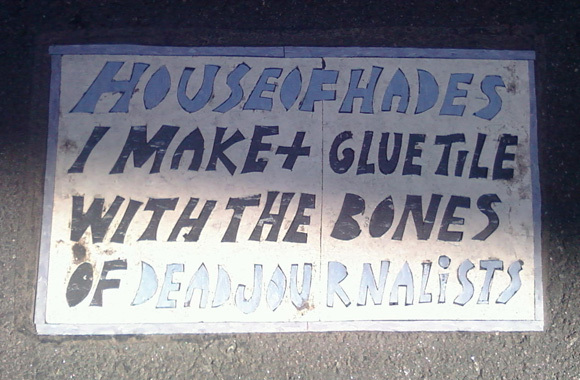 My first thought when I saw the House of Hades tile is “oh no, someone’s ripping off Toynbee Tiles to promote a Michael Douglas film virally or something. Great.” However, it appears that House of Hades is a genuine homage by someone who seems to have a genuine belief that life will be resurrected on Jupiter. Steve Weinek, a skilled photographer from Philadelphia, sings the praises for the House of Hades as the most skilled tilers around. In addition to showcasing some nice photography work, he has some great photo detective work on House of Hades, Toynbee and more. I recently found a House of Hades tile in Los Angeles outside the crosswalk on the corner of W 6th and S. Olive. He actually mentions the name … Mark Kellog … who is / was a journalist. Guess these are his bones. a st. louis person named “joe parisi” is said to have placed a large number of these. Apparently he was employed in media at one time. SoHo in this refers to the neighborhood in Manhattan. SoHo = South of Houston St.
Found a house of hades tile in louisville, KY. northbound intersection of seventh and liberty. You’re making it entertaining and you still take care of to stay it wise. I cant wait to learn much more from you. That is really a tremendous site. time to be happy. I’ve read this submit and if I could I wish to counsel you few fascinating things or tips. Maybe you can write subsequent articles referring to this article. I wish to read more issues about it! If you want to increase your familiarity just keep visiting this website and be updated with the most up-to-date news posted here. Saw a tile in downtown St. Louis that said “Joe Parisi + media hell” or something along those lines. Just a quick point about the point made above about how the tiler might be able to lay tiles at such a busy intersection. After I saw the documentary “Resurrect Dead” I was inspired to write a novel about the tiler. The method that I had the tiler use in my book was inspired by something I first heard in that documentary. . . Sevi, a.k.a. “The Tiler,” drives a car with a massive hole in the floorboard of the passenger side of his car. When stopped at an intersection he simply leans over, squirts some asphalt glue onto the road, and drops a pre-made package down on top of that. The package is covered by tar paper for initial stealth. After that it’s just a matter of the weight of heavy traffic and the heat of the sun. Just one theory, I suppose, but I think it makes sense. You can read more about it in my book, which can be found on my website or at Amazon, B&N, iBookstore, etc. them too? This might be a problem with my internet browser because I’ve had this happen before. There is a House of Hades tile on the south east corner of Colfax and Lincoln in Denver, CO. There are 3 House of Hades tiles in New Orleans. I finally got a picture of the the tile that is located in Downtown Los Angeles, it’s on Grand Ave. at 6th Street, just west of the intersection. It says something like “House of Hades: 1 man versus the American media. 2012”. Here is the link to the one I found in Downtown Los Angeles. Found a tile in DC in front of the portrait gallery. It reads: House of Hades The Radicalization of Toynbee’s Ideas in Society ‘2013. The deeds must be prevented. Reading this info So i am happy to express that I’ve an incredibly just right uncanny feeling I found out just what I needed.